Jan Wiezorek’s story “Pulled Pork” appears in Midwestern Gothic Issue 5, out now. For thirty-five years I’ve been stringing words together one way or another to support myself as publicist, free-lance journalist, writer-editor, corporate communicator, association marketer, teacher—and since summer 2011—as fiction writer. Writing has always been in my blood ever since Sister Mary George in high school said, “Writing is easy for you.” I don’t believe writing is easy, but the need for self-expression is important for everyone. Modern dancer Nancy Hauser, my first employer, called it “good for the soul.” Writing provides a near-spiritual outlet. If you were to take a highlighter and trace around Iowa, Minnesota, Nebraska, Illinois, and Michigan, you would have outlined the states that mean the most to me. I went to school in Iowa and Illinois, and I’ve also lived in Minnesota and Nebraska. Though I am an Iowa native, I’ve called Chicago home for 33 years. I love to vacation in Michigan, ride my bike on the back roads of Harbor Country, and find fossilized crinoids on Lake Michigan beaches. Kong, but the focal point of my short stories is right here in the Midwest. Regionalism has been strong in the Midwest, especially in the visual arts. Think of Grant Wood or Thomas Hart Benton. The Midwest has been a hotbed for writers from Theodore Dreiser to Studs Terkel. I suspect some writers come to the Midwest for study and then fly off elsewhere, and literary publishers typically have not made the Midwest their home. But when you think about our part of the country, so many strong writers come to mind—Willa Cather, David Mamet, David Rabe, Mike Royko, and Gwendolyn Brooks for starters. Your readers must have equally interesting writers in mind. The Midwestern Aesthetic is a nice package that has been here all along. It just took Midwestern Gothic to come along and unwrap it, for which contemporary readers and writers should be grateful. I love to use the Internet to send electronic submissions. I also want to use such tools as LinkedIn to promote myself and to make connections with readers, writers, editors, agents, and publishers, though I haven’t done much of that. I am not a strong Facebooker or Tweeter. Maybe I am too shy. I want my short stories to be the words I use to communicate, whether they are published traditionally, as a PDF, for Kindle users, or in an online literary magazine. A River Runs Through It and Other Stories, by Norman Maclean (Chicago: The University of Chicago Press, 1976). Broiled T-bone steak, medium, at Gene & Georgetti, Chicago. Any pizza anywhere is a close second. Mark Twain. He seems like a guy who wouldn’t mind sitting down and talking. All I’d have to do is ask questions, listen, and take good notes. 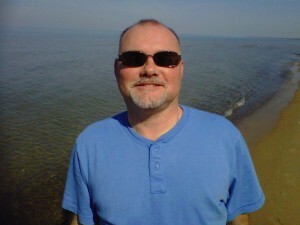 I’ve posted some of my published short stories at www.teachwrite.net, and I’d be happy for you to take a look. Thanks.